LaserTech Canada is host of the 2018 ILDA Conference in Montréal, Quebec. 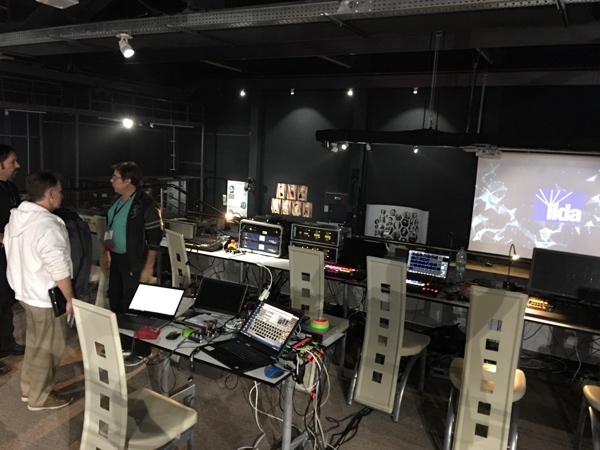 The Laser Projector Sponsor is LaserAnimation SOLLINGER, who is providing all lasers used at ILDA-produced events. 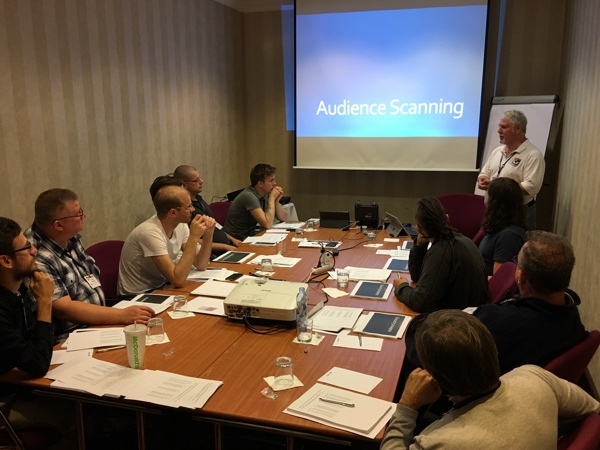 • Fri, Nov 9: ILDA Laser Operator Class, ILDA Advanced Audience Scanning Class (both optional extras). • Sat, Nov 10: ILDA LSO course (optional) and user group meetings. The first official ILDA Full Conference event is the Welcome Cocktail Reception and Dinner. • Sun, Nov 11: ILDA General Business Meeting, Advanced Technology Workshop. Lase-Off & Laser Jockey competition. • Mon, Nov 12: Workshops and seminars, ILDA Awards Banquet and Presentation. The video below, shot last year, gives you a quick visual overview of what an ILDA Conference is like. There are meetings and seminars in the day, and in the evenings, the Lase-Off and the ILDA Awards. The informal discussions in halls and bars, can be just as fun and important to your business as the official events. 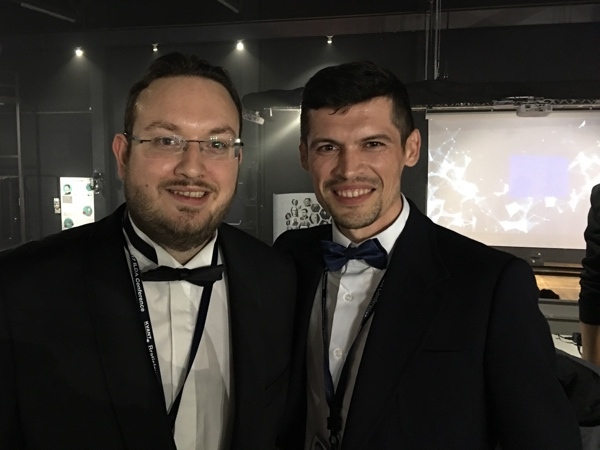 Thanks to KVANT, host of the 2017 ILDA Conference, for producing the video. 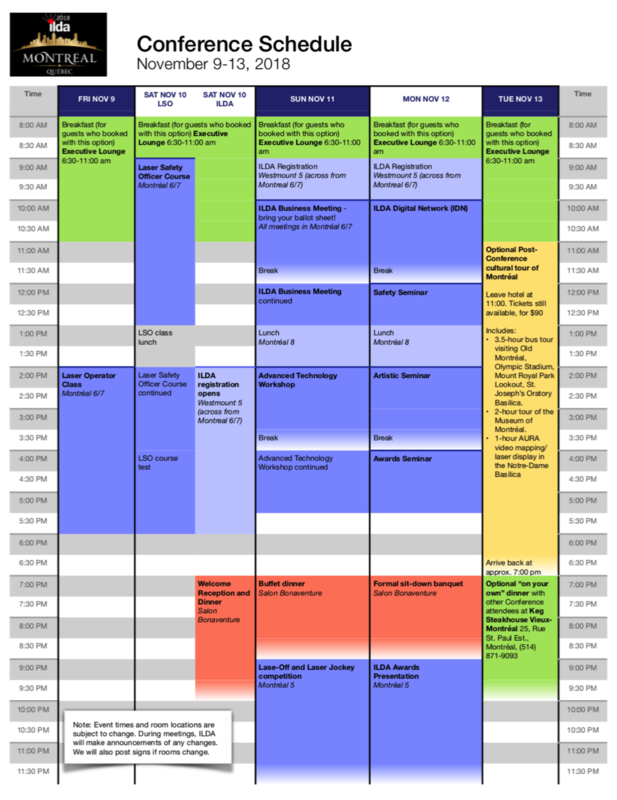 Below is the detailed schedule for this year's Conference. Click on the image for a full-sized PDF version. Below is information about Conference-related events. To register for any of these events, click the button below. It will take you to the Event Registration page at the ILDA Member & Event Management website. • Full Conference registration includes all ILDA meals, Welcome Reception, Lase-Off, Awards, business meetings, seminars, and workshops. • Spouse/Guest registration includes all ILDA meals, Welcome Reception, Lase-Off and Awards. It does NOT include any business meetings, seminars or workshops. A Spouse/Guest is defined as a person related to a Full Conference registrant. The relationship must be that the spouse/guest is married, is a significant other, is a family member, or is a personal friend who is not employed in a lasershow-related business. Full Conference and Spouse/Guest registrations do NOT include any Laser Safety Education classes or the Cultural Tour, which are separate Conference events. 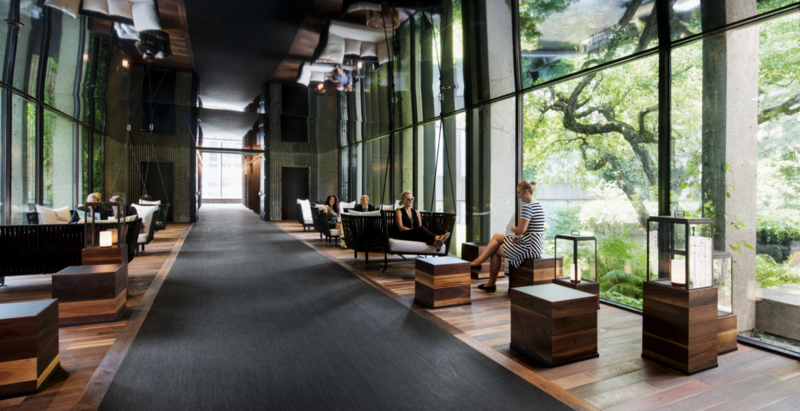 Also, Full Conference and Spouse/Guest registrations do NOT include hotel room reservations, which are made separately with the Hôtel Bonaventure. Note: All Full Conference prices shown above include a $250 credit for if you book your room at the Hôtel Bonaventure, using the hotel reservation link listed elsewhere on this page. You also receive the $250 credit if you live in the Montréal area and stay at your home each night. 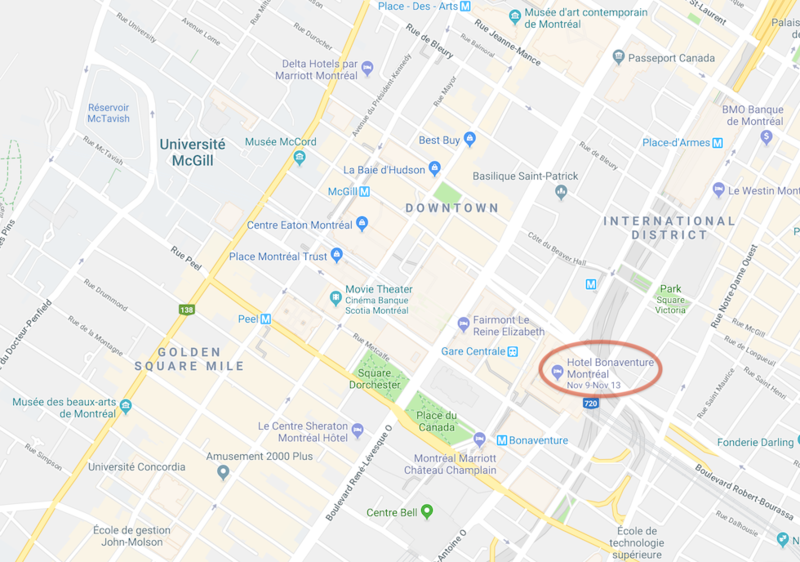 But if you stay in another hotel, or otherwise do not book using the Hôtel Bonaventure hotel registration link for ILDA attendees, your ILDA registration cost will be $250 higher, in order to cover ILDA's hotel contract penalties. Note: Full Conference prices in green include a $250 credit if you book your room at the Hôtel Bonaventure, using the registration link listed above. You also receive the $250 credit if you live in the Montréal area and stay at your home each night. 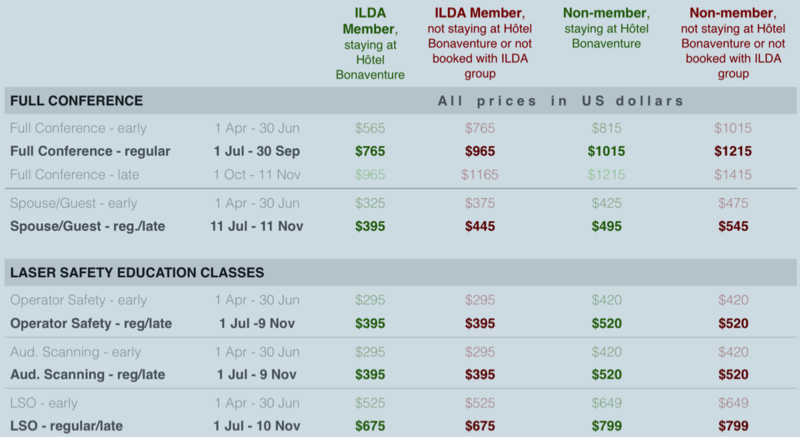 Prices in red are the cost if you stay at another hotel, or if you otherwise do not book using the Hôtel Bonaventure registration link/code for ILDA attendees. The higher Full Conference prices allow ILDA to cover hotel contract penalties. If you are an ILDA Member who is NOT registering for the Full Conference, you still can attend the General Business Meeting for free. 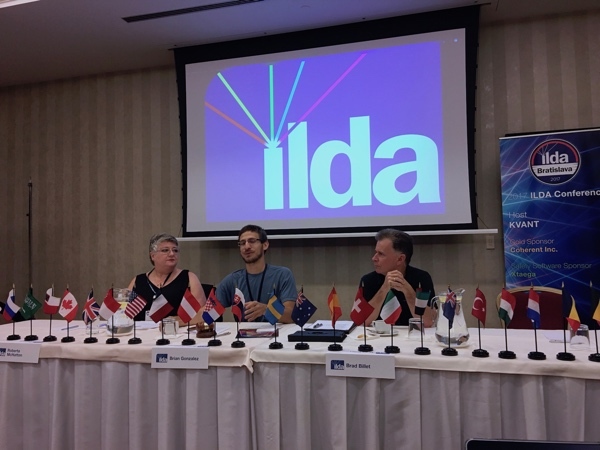 This event is where votes are taken for ILDA Board Members and for ILDA President, and where association business is discussed and voted on. To attend, you must register in advance for the General Business Meeting at the Event Registration page. This event will be visible only to current ILDA Members (it will not appear on the list of events for non-members). 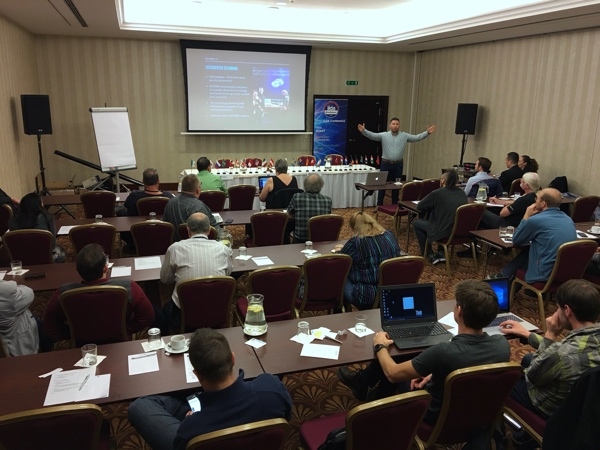 The Laser Safety Education classes are not included in the Full Conference. These are separate registration events. Anyone may attend the Laser Safety Education classes. You do not have to be an ILDA Member, and you do not have to register for the Full Conference. • Optional Laser Operator Safety, Friday November 9, 2 pm - 6 pm. Basic lightshow safety, for persons working around lasers or who are operating lasers for lightshows and displays. Pricing through June 30 is $295 for ILDA Members, and $420 for non-members. Prices go up $100 starting July 1. • Optional Audience Scanning Safety (note: This class has been canceled due to instructor scheduling conflict). How to do safe, legal and effective audience scanning at laser lightshows. For both operators and show designers. Prior laser safety experience or courses are recommended. • Optional Laser Safety Officer for U.S. Lightshows, Saturday November 10, 9 am - 6 pm, with a break for lunch. 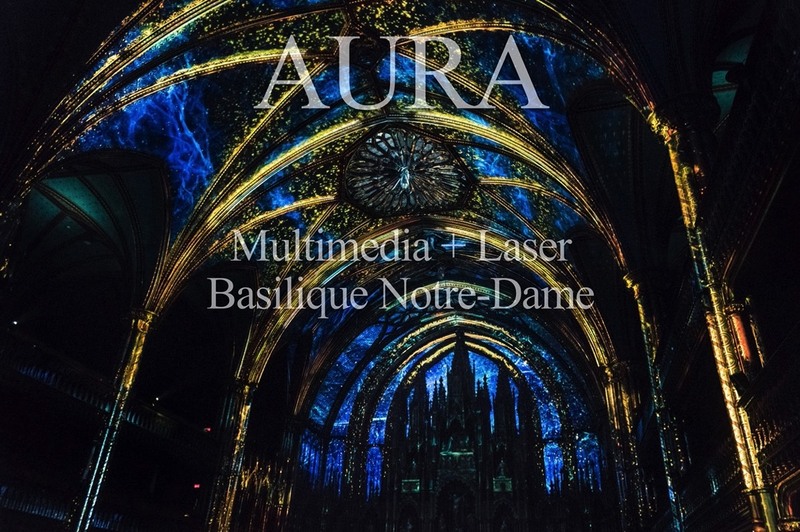 This covers laser shows only -- no medical, industrial or other non-lightshow laser usage. While European and international regulations are discussed, the majority of the regulatory discussion is on U.S. laser and aviation issues. To take this class, you must have prior laser show experience, or have taken ILDA's Laser Operator Safety course. If you have questions whether you are ready for this class, contact ILDA. More info is at the LSO course page. Pricing through June 30 is $525 for ILDA Members, and $649 for non-members. Prices go up $150 starting July 1. 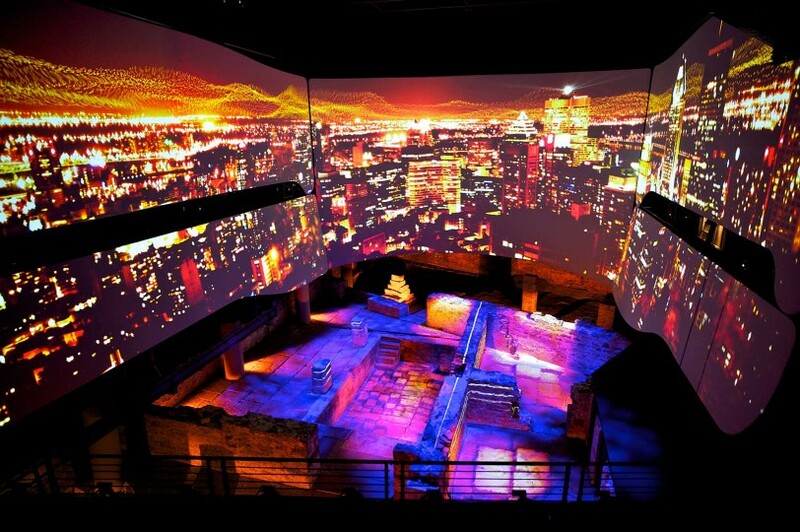 The Post-Conference Cultural Tour is an opportunity to see highlights of Montréal along with your ILDA colleagues and friends. 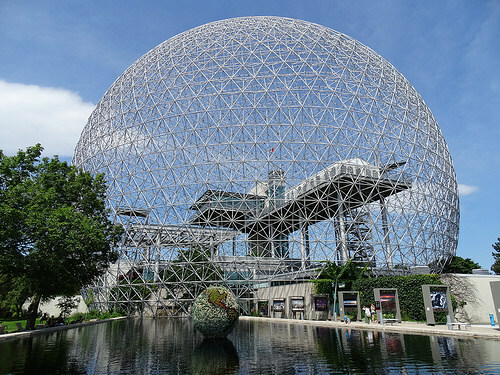 3.5-hour bus tour visiting Old Montréal, the Olympic Stadium, Mount Royal Park Lookout, and Saint Joseph's Oratory basilica. The Cultural Tour is a separate registration event at $90 per person. Anyone may register to go on the Cultural Tour. You do not have to be an ILDA Member, and you do not have to attend the Full Conference. Click here for a PDF with details about the tour. The tour will end at 7:00 pm at the Keg Steakhouse Vieux-Montreal. This dinner is optional and is "on your own" -- the dinner price is NOT included in the Cultural Tour. Any tour participants who do not wish to eat at the Keg will be taken back to the hotel after Keg diners are dropped off. Also, after the dinner ends, transportation will be provided from the Keg back to the hotel. Above is information about Conference-related events. To register for any of these events, click the button below. It will take you to the Event Registration page at the ILDA Member & Event Management website. Don't forget to make your reservations directly with the Conference hotel. Use the blue button with the hotel reservation link, located elsewhere on this web page. There are two reasons to use the buttons above, to book at ILDA’s hotel using ILDA’s discounted rates. 1) While you might find lower room rates from some online sites, unfortunately these often are not refundable, are in limited supply, or in other ways are not comparable to ILDA’s rates. ILDA has the guaranteed lowest rate available from the hotel for our class of service. 2) If you use the links above, you will receive a $250 discount on your ILDA Conference registration. If you book using other websites, discount suppliers, or if you stay at other hotels or locations, you will have a higher ILDA Conference registration rate — e.g. you will pay $250 more. This is because ILDA’s contract guarantees a certain number of room reservations. 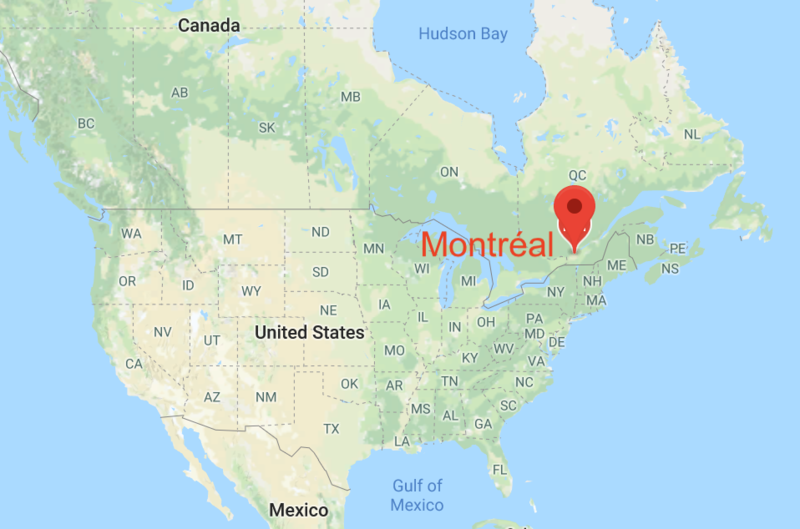 If we do not meet this minimum, we will have to pay extra for persons who live outside of Montréal and who attend the Conference but do not stay at the hotel using ILDA’s rates and booking code. Note: If you live in the Montréal area and you will stay in your home each night of the Conference, you will receive the $250 registration discount. 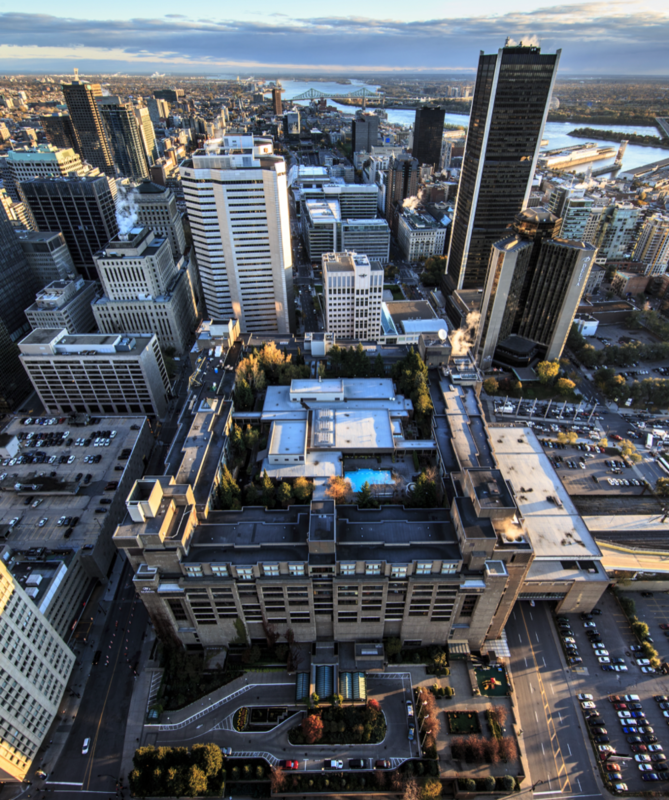 The official Conference headquarters is the 395-room Hôtel Bonaventure, located on the top floors of the tradeshow/office complex of Place Bonaventure. It is a true Garden of Eden overlooking the bustling streets of the city. It features a year-round heated rooftop outdoor pool, and a rooftop garden with trees, flowers and waterfalls. Guest rooms are on two floors which surround the gardens. They have city or garden views. Montréal’s passenger international airport is Pierre Elliott Trudeau International Airport (YUL). You can take a taxi to the Hôtel Bonaventure for a fixed rate of CDN $40. There is also a “Bus 747” which is $10 per person. The bus stop is two blocks from the hotel — about a five minute walk. Should you want to rent a car, the hotel has paid parking ($39/day for 24-hour in/out valet or $24/day for 24-hour in/out self-parking). Place Bonaventure is connected to Montreal's underground city, Central Station and the business district, Old Montreal, and major attractions. 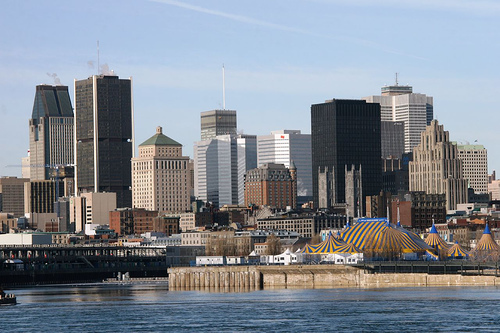 It is linked to the Bonaventure Metro station, to the AMT commuter train stations (Lucien-L'Allier and Central Station), AMT's downtown bus terminus and to inter-city train service (Via and Amtrak at Central Station). You may ship material to the hotel directly. They accept shipments up to 5 days prior to the event (e.g., starting Nov. 4) but they strongly recommend shipping 2 days prior to the event (e.g., starting Nov. 7) due to limited storage space. 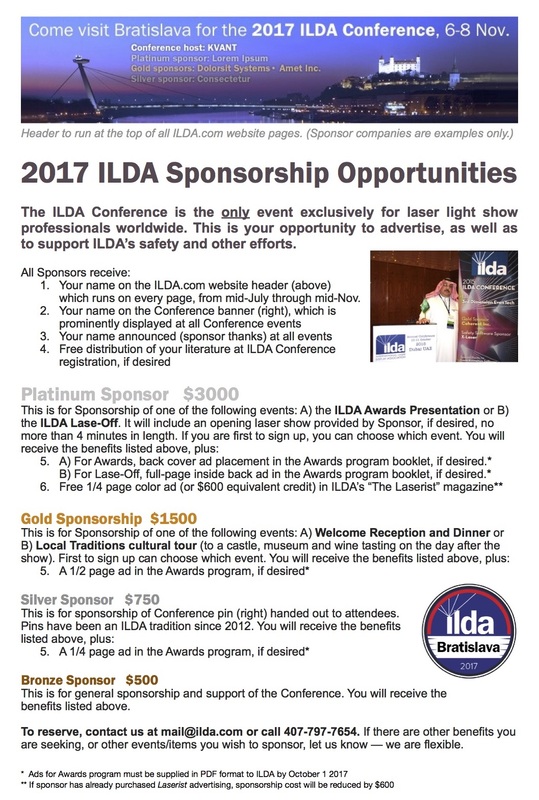 Sponsors help ILDA present Conference events. If you’d like to reach the world’s top laserists, please review the sponsorship material below, and then contact us (link at bottom of the page). If you are looking for a particular benefit not listed, let us know — we are flexible.